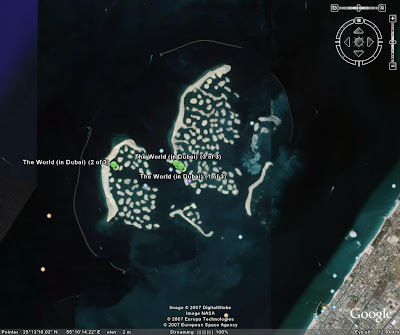 Following another great article from my favorite urban culturist about Islands and their roles in cultures and literature I was dragged to dig a bit further into the subject of the Dubai World Islands. Watching the accompanied 3D simulation movie I was first under the impression this megalomaniac project is yet in design stages and that nothing is really there. I was very wrong. This thing is already there. 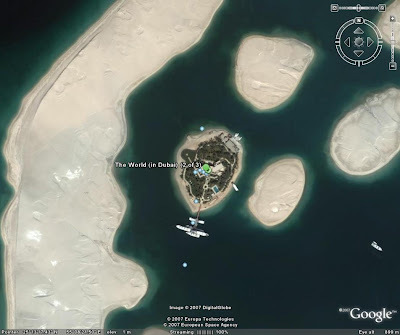 The first island is already there owned by Formula 1 race car driver Michael Schumacher. 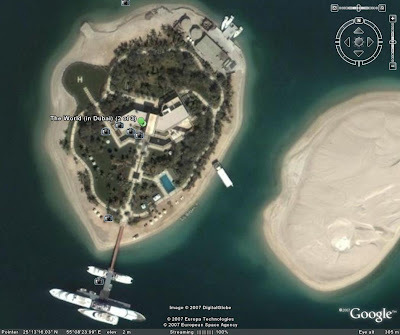 According to Mark Amherst from privateislandsblog.com, probably the most popular blog on the internet dedicated to private islands, the $7 million dollar island seen below was given to Schumacher by Dubai’s crown prince, Sheikh Mohammed bin Rashid Al Moktoum. Other celebrities who have purchased property there include Rod Stewart who spent $3 3 million to buy the island of Great Britain. The entire project is scheduled for completion in 2008. 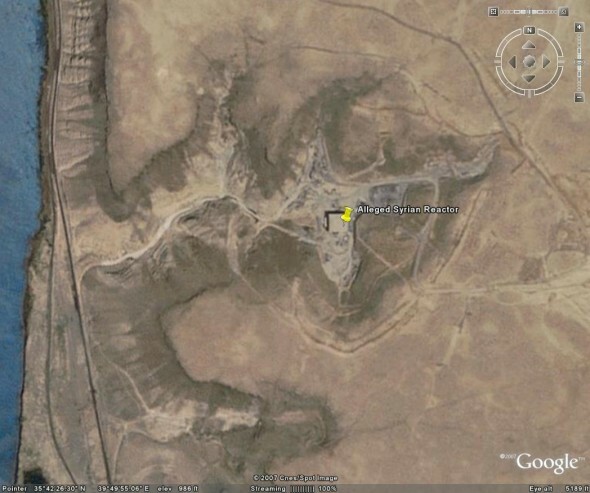 Thanks to Google Earth and googlesightseeing.com we can keep an eye on this project ourselves (get the kml file here). Yet, there is also an official project website at http://www.theworld.ae where the company behind it named Nakheel (Arabic: نخيل palms or palm trees) Properties offers some official movie clips that just showed up on YouTube for us to watch. 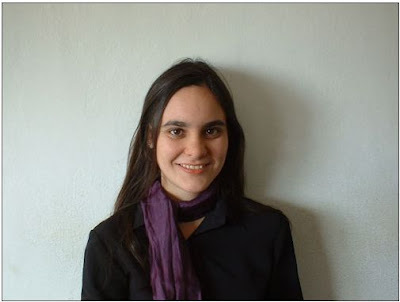 October's Triple Google Dance: eliminating Paid Link industry? Google Dance is a Search Engine Optimization (SEO) professional term referring to the period of time when Google indices are tuned. According to Wikipedia Google Dance often cause "both a fluctuation in index size as well a significant change in a web site's search result position." A week ago, on Wednesday morning October 24, the world was witnessing an electronic Tsunami of reports from around the web reported about famous websites and blogs having their Google PageRank value significantly decreased during the recent performance of the Google dancer. Seomoz.org, a Seattle-based SEO blog and a hub for search marketers worldwide, followed-up and put up this list with some prominent websites that got hit. A few examples would be autoblog.com (from PR6 to PR4), forbes.com (from PR7 to PR5), engadget.com (from PR7 to PR5), copyblogger.com from (PR6 to PR4) and the famous blogger johnchow.com who now has to get up in the morning to a new PR4 blog, rather than the PR6 he was used to. According to Seomoz.org the most reasonable explanation for the recent change, that seem to be going further than we use to, is that the losses are "primarily a result of Google's continuing public relations campaign against paid linking." Opening the doors for corporate capital to override "people's voice" which is how Google have always seen their PR algorithm, Paid Linking is everything but how Google want to see their multi-billion dollar machine ranking Internet pages. I stumbled up this explanation in a few more blogs. Some even suggest that, as opposed to how things are usually done with Google, this time there seem to be some kind of manual override and that some websites are simply "being punished". 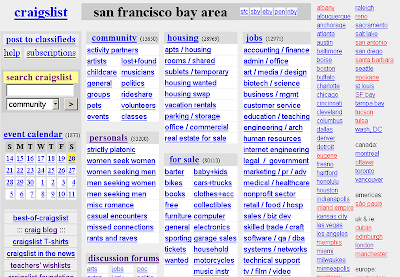 It is not clear if Google indeed seeks to eliminate the entire Paid Link industry. Yet, I agree with Loren Baker of searchenginejournal.com that "if Paid Linking houses use PageRank as a pricing metric, then eliminating or devaluing PageRank will devalue paid linking" so this is definitely an option here. Furthermore, Techcrunch reported yesterday that even though, normally Google update page rank once every three months, sometimes not that often", the recent PR "downgrade" of a broad range of blogs was in fact the third Google dance in October 2007. This never happened before and something is definitely going on with Google PageRank. Above image is sourced from www.answers.com/topic/pagerank. More about possible future scenarios for the Paid Link industry in this article by dailyblogtips.com title The Future of Paid Linking and more about Google PageRank on this Wikipedia article. Oh yes, this recent PR "zetz" was actually pretty good for my blog as it was upgraded from PR2 to PR3. I guess one's loss can sometimes be someone else's cause for celebration. Is that a cruel world or what? 18 years ago, in 1989, I left The Department of the Theater Arts in Tel Aviv university and joined a fringe production written by a friend who was studying with me, and served as assistant for director Rami Danon who was already a well known and reputed theater director. 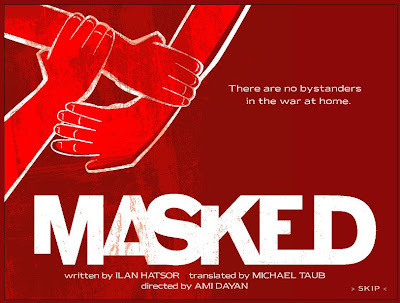 The young writer was Ilan Hatzor and the play was named "Reulim" (AKA "Masked") which is the Hebrew word for the face cover used by Palestinian activists, demonstrators guerrilla fighters and terrorists. 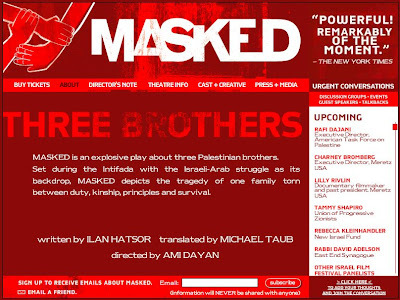 The play was about the story of three Palestinian brothers struggling with their loyalty to duty, family, principles and survival when one of them is accused of collaboration during the first Intifada. After about a year of hard work we went to the Acco Fringe Theater Festival and won 5 first prizes for best play, best leading actor, best decoration (Amnon Levi) best soundtrack and best direction (Rami Danon). After it was purchased by The Cameri, a leading Israeli theater production house, I continued working with the Reulim production for almost two years. It was one of the most exciting times in my life. We played all over the country about 10-12 times a month, earned well and had time for lots of others things. But I also made a few very good friends with some of the folks in this production, mainly with Yigal Naor, the leading roll actor who won the first prize for his performance and was already becoming a mega star in the sky of Israeli Theater. The play gained enormous success, helped Ilan become a leading play writer and was recently even launched in the DR2 Theater in Union Square, New York as you can see in the above screenshot. 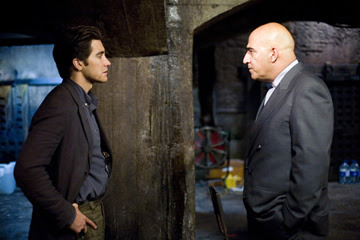 "A thickset character actor with an exotic countenance (piqued by his bushy black eyebrows and bald pate), Yigal Naor opted to parlay his appearance into gritty, evocative portrayals of thugs and heavies onscreen -- often, though not always, characters of expressly Middle Eastern origin. He took his premier onscreen bows around 1987 but peaked in activity approximately two decades later, in the early 2000s. 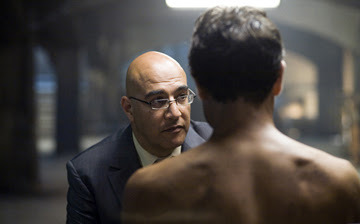 Memorable portrayals included that of a principal in the 2004 Israeli comedy Bonjour Monsieur Shlomi, the terrorist Mahmoud Hamshari in Steven Spielberg's Munich (2005) and the intimidating head of an underground prison in the thriller Rendition (2007)." I think I can safely say Yigal and I liked each other from the minute we met. Other than being a huge muscled body person with a thunder tenor voice and a genius stage performer, which was pretty cool, Yigal had a very interesting history and very special views about life. That would be mainly as opposed to me who was hardly 20 years old and didn't know much of anything. I guess you can say he was like my older brother but anyway, as we got closer I learned about Yigal the most important thing there is to know about an actor: his dream roll. 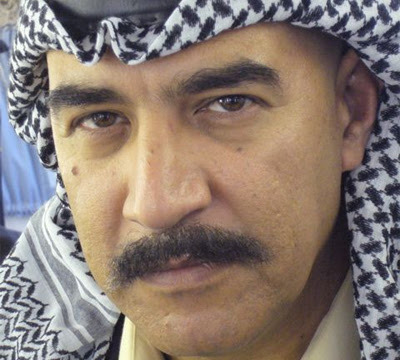 "HBO Films and the BBC are co-producing a four-hour miniseries that recounts the 24-year reign of Saddam Hussein. The four-part miniseries, titled "Between Two Rivers," will offer a detailed look at the inner workings of Saddam's family and his relationship with his closest advisers and shed light on his 1979-2003 reign as president of Iraq. Yigal Naor ("Munich") is set to play Saddam, while Oscar-nominated actress Shohreh Aghdashloo ("House of Sand and Fog") will play his wife, Sajida. Another wife, Samira, will be portrayed by Christine Stephen-Daly ("The Bill")." Well? what do you say about that? isn't this cool? If any of us needed another proof for how real global warming impact is I am sure, as sad as it is, the recent events in southern California might "help" on that. According to france24, a French international news channel broadcasting on a 24/7 basis, it seems that the Californian Firefighters are getting the upper hand on one of the worst fire disasters in Californian history, thanks to "cooler temperatures, calmer winds and spots of drizzle". 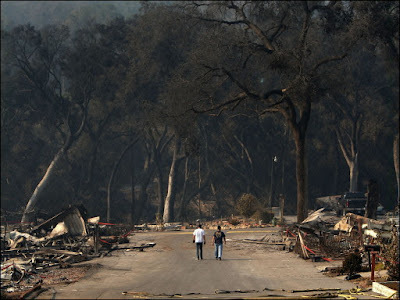 Thus, most of the 23 fires that have erupted since last Sunday, leaving seven dead, destroying 1,800 homes and displacing 640,000 people, had been staunched or contained. 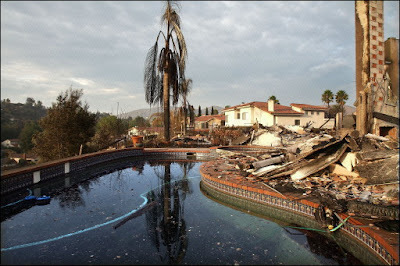 There is also an economical aspect to this with a very large price tag: According to france24, San Diego County officials estimated the property damage at "more than one billion dollars" but the insurance industry guys say it may go "as high as 1.6 billion." Think about all the solar power electricity we could have get for this price tag. Furthermore, for me and beginning this morning, there is also a personal aspect for this story. 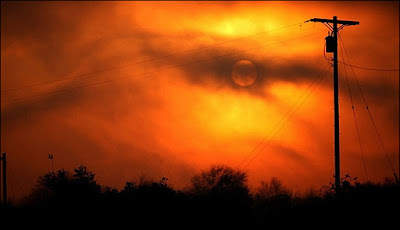 Earlier today I got a heads-up from my friend Leena of ConceptisAddict about a very special post that was made by a member nicknamed agree, in Conceptis' Puzzles and Life forum. Reading this post I immediately felt this bitter-sweet taste. I felt sad for what is going on in California but at the same time also felt happy to see what we have been doing in Conceptis in the past 10 years can really bring a bit of joy to people in when they need it most. 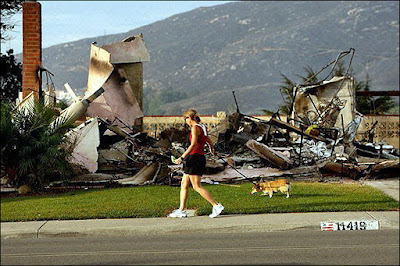 "As many of you know, Southern California was ravaged the past week by wildfires. As my wife and I were packing up to evacuate our home, I grabbed a folder of Conceptis puzzles that neither of us had gotten to. Over the next four days, with little to do but worry about our home and those of our friends, having these fun and challenging puzzles really helped ease the stress and pass the time. 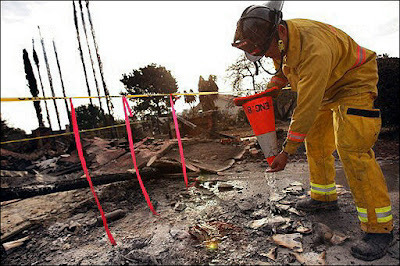 Fortunately, our home and street were untouched by the fires. I'd like to thank Dave Green and all the folks at Conceptis for creating these puzzles and website - and also thank susie_cc, lekahe, cyclone, wisdemol, izakkay, and all the others who have either directly sent me their puzzle archives or links to them." 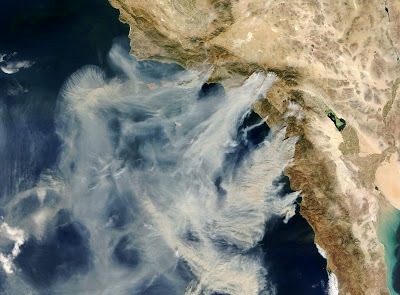 The above satellite image from nasa.gov shows the wildfire area as photographed yesterday October 27 (More images of very high resolution here). Following is a set of updated photos taken just yesterday and two days ago by Spencer Platt of AFP. Some people say hunting elephants was the real type of activity director John Huston had in mind when he decided to do The African Queen. Anyway, right from the start, he insisted this is not going to be just another cardboard decorated studio feature. 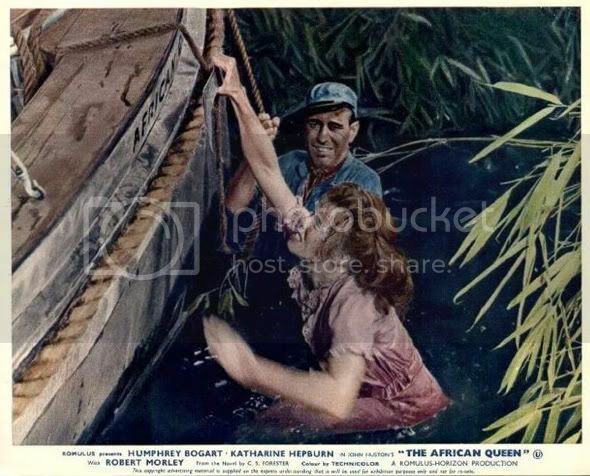 Ranked by the American Film Institute in 2007 as the 65 greatest movie of all time, The African Queen had to be made on location, where real crocodiles and leaches eat real people. Looking for the most perfect place to follow C. S. Forester's fascination, Huston had to fly 25,000 miles across the African continent until finding the right spot, on the Ruiki river in what then used to be Belgian Congo. The magic chemistry between Katharine Hepburn (Rose Sayer) and Humphrey Bogart (Charlie Allnut) seen in this early color movie is of the most famous in motion picture history, as "other plot elements were secondary comparing to the quintessential love-hate relationship that went on between Rose and Charlie." 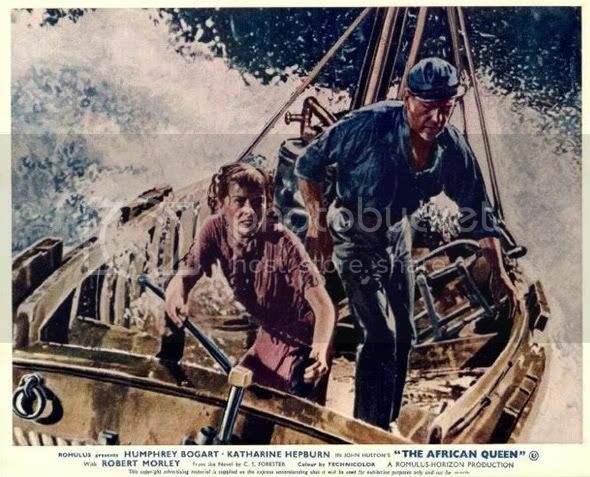 Yet, the thing mostly remembered about this movie is that the making of The African Queen was an adventure, and not a very easy one for unexperienced explorers as the people who made it. "At a time (1951) when on-location shooting was nowhere near as common as today, traveling 1,100 miles up the Congo to make what is essentially a filmed dialogue must have seemed fanatical. And subsequent encounters with blood flukes, crocodiles, soldier ants, wild boars, stampeding elephants, malaria, and dysentery were hardly reassuring." "in the 1940s and 1950s [...] films might go to a famous locale and shoot a couple of scenes for realistic flavoring, as with a couple of scenes in On The Town or An American In Paris. Many Westerns had been shot on location, but that was no great challenge given the close proximity of Hollywood to Western locales. John Huston had previously filmed The Treasure of Sierra Madre in Mexico, but going to the Congo and Uganda for extensive filming had rarely been attempted (sorry, all those Tarzan movies were filmed in California). 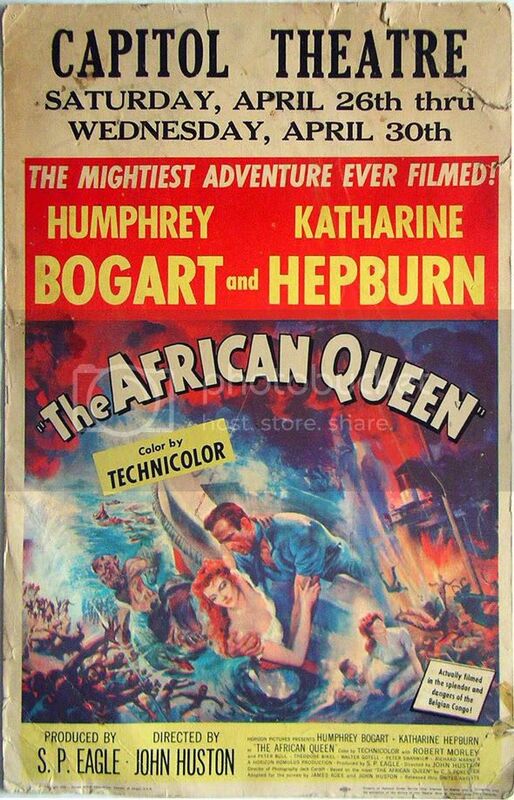 It was a spectacular undertaking (which Katherine Hepburn recorded in a book she wrote about making The African Queen)." And indeed, the "spectacular undertaking" experience had triggered many books and articles, some of them written by Hepburn herself. 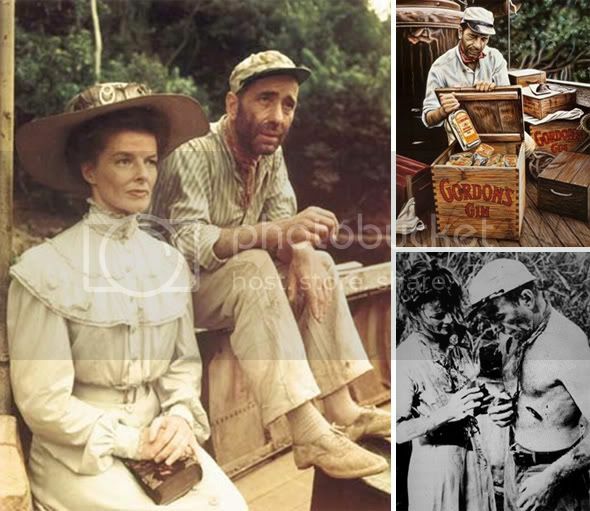 In her 1987 book The Making of The African Queen, or How I Went to Africa with Bogie, Bacall and Huston and Almost Lost My Mind, cited on IMDB, Hepburn describes the first African Queen shooting day, which required five cars and trucks to take the cast, crew and equipment three and a half miles from Biondo to the Ruiki river. They then loaded everything onto boats and sailed another two and a half miles to the shooting location. Hepburn describes Huston's obsession with hunting and how one day she was convinced to join Huston on one of his hunting journeys when he "inadvertently led her into the middle of a herd of wild animals" from which they were "lucky to escape alive." Also, according to IMDB, dysentery, malaria, bacteria-filled drinking water and several close brushes with wild animals and poisonous snakes is just a partial list of the close encounters participants of this movie had to deal with. In addition, most of both cast and crew "were sick for much of the filming." Yet, other sources claimed almost everyone in the cast and crew got sick. Everyone except for Huston and Bogy, who attributed it to the fact that they basically lived on imported Scotch as later described by Bogart whom this role won him the only Oscar of his career: "All I ate was baked beans, canned asparagus and Scotch whiskey. Whenever a fly bit Huston or me, it dropped dead." Here is the original movie trailer on Youtube as seen on 1951. As you can see, the fact it was taken on location and included authentic African sights was emphasized by the distribution company that realized how new and exciting they would be for studio-used audience. Enjoy. While we are on the subject of rumors, In our new media enhanced universe it's really just a question of time until everything is revealed. Even some things USIsrael government rather leave hidden. 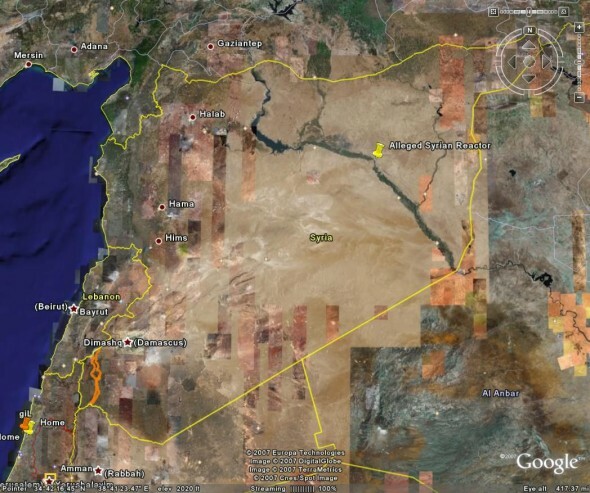 Thus, the Institute for Science and International Security (ISIS) website now serves the original DigitalGlobe imagery pdf report of the location where Israel airstriked Syria September 6 this year. 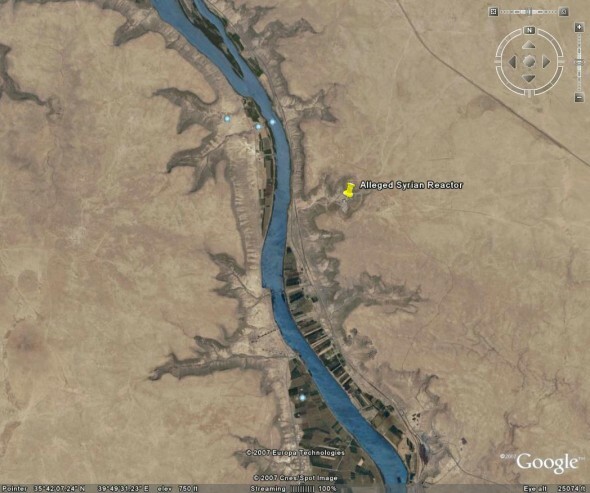 The photos, taken on Aug 10, show the location reported on the Washington Post this Wednesday, informing us that "The facility is located seven miles north of the desert village of At Tibnah, in the Dayr az Zawr region, and about 90 miles from the Iraqi border". Based on size and proportions of the structures it is suggested that "Syria might have been building a gas-graphite reactor of about 20 to 25 megawatts of heat, similar to the reactor North Korea built at Yongbyon." Stefan Geens of Ogle Earth, my favorite virtual globe blog with a special focus on Google Earth, published this amazing photo article discussing the recent news and saving us the trouble of searching ourselves. If you have Google Earth installed just click here to save the kml file and run it. "There on the eastern bank" says Geens, "is an unmistakable candidate nuclear reactor building, 45m x 45m in size, apparently still under construction". 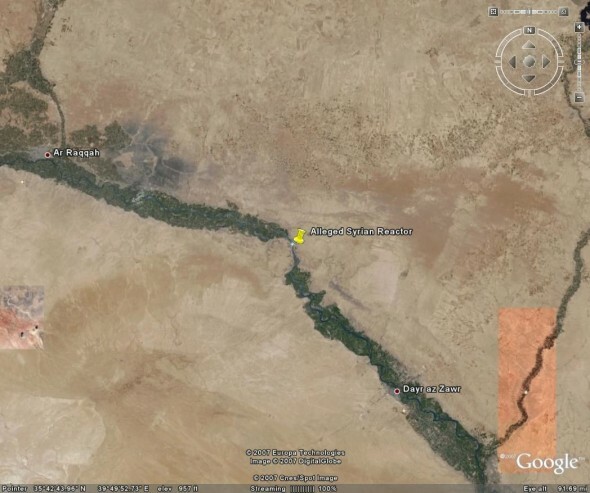 It also turns out that all of the sudden, since the last time Geens checked (a few weeks ago), the entire Syrian part of the globe has been upgraded with much higher-resolution image coverage in Google Earth. Ha! A few open questions: Is Bashar al-Assad becoming a celebrity? 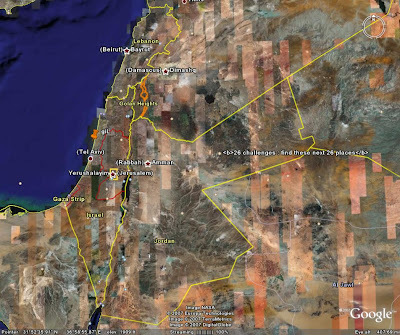 Are we expecting a better resolution GE images of Israel soon? If so, is this going to be for similar reasons? Just check the bottom left of the last picture above. This is where we live. Welcome BlogCatalog. Still love you MyBlogLog. 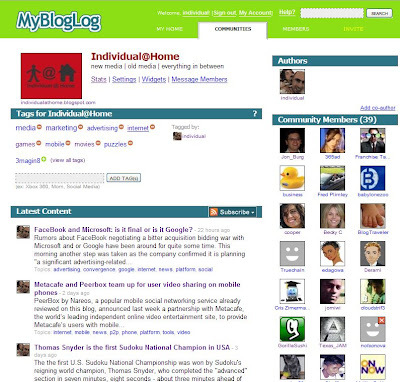 The requirement of being reviewed and accepted rather than just going through the usual registration process we know from most Internet services is perhaps the most important difference between BlogCatalog and its sibling/rival community MyBlogLog (MBL), both probably the two leading social blog directories on the Internet. Other differences, at least as I see it, also help to position BlogCatalog in a somewhat higher scale than MBL, allowing it to take this more "daring" attitude: A better looking GUI design and the unlimited number of communities you can join every day in BlogCatalog comparing to a maximum of 15 each day in MBL are just some of them. So, I am happy to report my avid readers this message from BlogCatalog had just landed in my gmail box a few hours ago, informing me my blog Individual@Home "has been reviewed" and "approved"! what do you say about that? My blog has been reviewed and approved! I feel like its me who have been approved here, not just my blog... my whole personality, technical skills and general knowledge have been approved. FaceBook and Microsoft: is it final or is it Google? "Facebook has invited some of its closest advertisers to an event on November 6 in New York. As part of it, Facebook executives will discuss new approaches for advertising online. We are not sharing any further details." Owen Thomas from the valleywag.com says we need not rely on any rumors as for the real confirmation all we need is a bit of digging into FaceBook: Apparently, Brandee Barker, the charmingly indiscreet head of Facebook PR, has added Adam Sohn - global sales and marketing PR at Microsoft - as his FaceBook friend. Just buddies? Fooling Google to take its bid up? we'll see soon. Meantime New York Post reporter Peter Lauria said multiple sources had indicated a battle for the deal and that we may even see results within the next 24 to 48 hours. According to timesonline.co.uk, value the social networking site FaceBook may sky high to more than $10 billion (£4.97 billion). Looking at the social media advertising business its no wonder at all: According to a recent research from eMarketer, for example, Social Networks ad spending is expected to reach $1.38 billion this Year, enormously growing to $3.63 billion in 2011. Here is a business you should look into. Have a FaceBook account? mine is here. 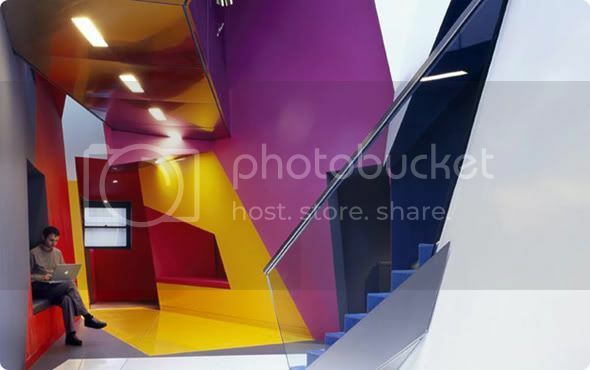 PeerBox by Nareos, a popular mobile social networking service already reviewed on this blog, announced last week a partnership with Metacafe, the world’s leading independent online video entertainment site, to provide Metacafe’s users with mobile social networking. With the help of PeerBox technology, Metacafe users may now access, download and share user generated videos directly from mobile phones. 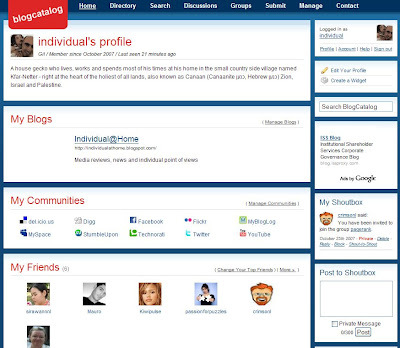 Yet, the PeerBox technology also provides extended social functionality such as rating, commenting, etc. 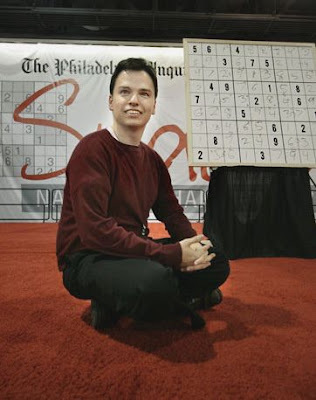 The the first U.S. Sudoku National Championship was won by Sudoku's reigning world champion, Thomas Snyder, who completed the "advanced" section in seven minutes, eight seconds - about three minutes ahead of his nearest rival - took home the first prize of $10,000 and granted a spot on the U.S. team at the World Sudoku Championship. 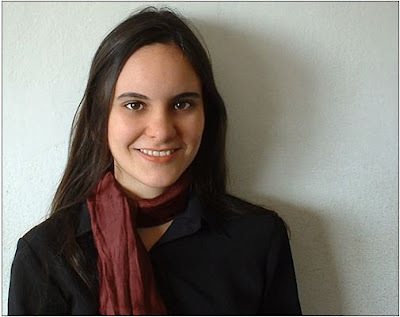 Snyder, 27, a postdoctoral student of bioengineering at Stanford University in Palo Alto, California, a Harvard University PhD. in chemistry and an avid puzzle blogger, said he had been playing Sudoku and other puzzles since he was 5 years old and into "competitive puzzling" for the last 2.5 years. More than 800 people have attended the the first U.S. Sudoku National Championship, a larger crowd than expected according to organizers, proving the enormous popularity of this number logic puzzle has not declined. Sponsored by Philadelphia Inquirer and hosted by American puzzle guru and media figure Will Shortz, the Championship was an opportunity for logic puzzle enthusiasts from across the United States to test their skills. Philadelphia Inquirer says a survey they did last summer found 56% of U.S. population had already experienced solving Sudoku puzzles. 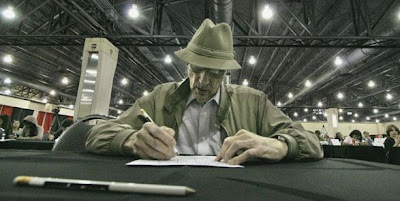 Photos above are sourced from and courtesy of The Philadelphia Inquirer Sudoku National Championship. Congratulations Thomas! The first thought that came to our heada when we saw the photos of the Film & Visual Media Research Center at the University of London’s Birkbeck College is that someone was crazy enough to color a copy of the cardboard decoration from our number one favorite horror movie The Cabinet of Dr Caligari, a 1921 silent B&W masterpiece from genius director Robert Wiene. Apparently we were not very far from truth and the Architects of this construction were aiming at anyone who realizes how cool this movie is. 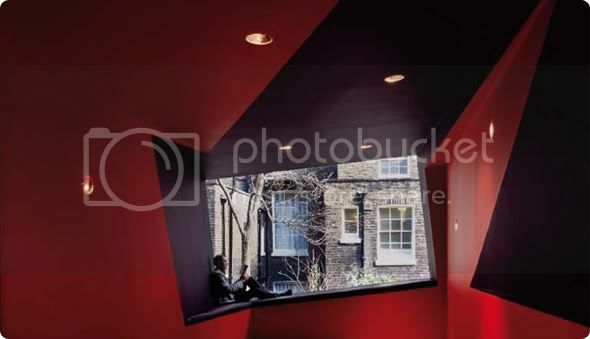 According to The Cool Hunter, a dot uk blog focusing on global zeitgeist phenomenas and fashion who posted these pictures, London-based Surface Architects created this magnificent new home for the institute using an old reconstructed building as a “cover” when basement, ground floor and the extension were transformed "Robert Wiene style" into a cinema auditorium, surrounded by all other necessities such as media study suite, seminar rooms and offices. 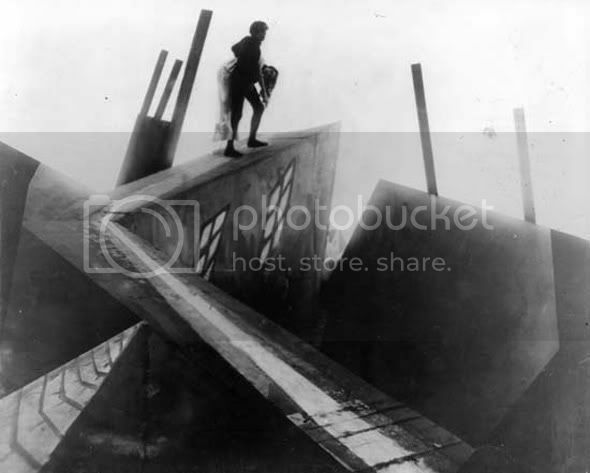 Ian Christie, Birkbeck’s Professor of Film and Media History, kind of said so himself when explaining how the projection of intersecting cones has various film associations and how “the jagged angles recall the Expressionist set design of The Cabinet of Dr. Caligari, an influential German film of 1921”. Here is a small taste of the original Dr. Caligari cardboard decoration, just in case you still didn't have the pleasure to watch it. Lastly, as we live a new world where media is freely shared by movie buffs, here are ten whole minutes with the Dr. and his human living-dead pat, hosted for you by a Google Inc. company. Thank you so very much Mr. BigBananaTV! On June 20, 1975 when Jaws was limitedly released at 409 theaters, followed by a wider release five days later into 675 theaters the word Blockbuster was still never used to describe a movie. 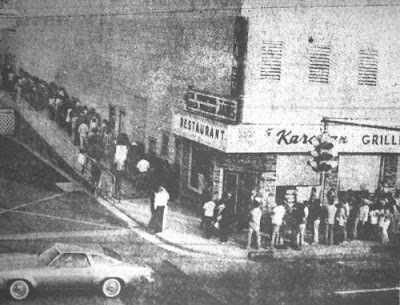 American media needed a new word to describe what this movie did to people: Based on Peter Benchley's best-selling novel and inspired by a real event, audiences loved to be horrified by that movie so much that they were literally lined-up around street blocks, causing traffic jams, waiting to see it again and again. Truly said, with films about aliens and dinosaurs, Spielberg is first and foremost a dreamer, and Alfred Hitchcock was the one to show us how much we love to be scarred. Yet, in the old world where people were still paying money to watch movies more than once Jaws will always be remembered as the one that showed us how much we are willing to pay to be afraid. “See it again, this time with your eyes open” said one of the movie advertisements and, indeed, some people had seen this movie much more than twice. On June 23, 1975, just three days after its official release, the phenomenal success of Spielberg's low-budget shark thriller made the Time cover. According to Wikipedia on its first weekend Jaws grossed more than $7 million, and was the top grosser for the following five weeks. During its run in theaters, the Jaws beat the $89 million domestic rentals of the reigning box-office champion, The Exorcist - an Academy Award-winning horror thriller and one of the most profitable horror films of all time - and became the first film to reach more than $100 million in theatrical rentals. Eventually, Jaws grossed more than $470 million worldwide (around $1.85 billion in 2006 dollars) and was the highest grossing box-office hit until George Lucas' Star Wars was released two years later. And while we are on the mashup subject, here is another interesting mashup application named Last.fm - The Social Music Revolution. With more than ten million page views a day and claiming for the world's largest social music platform crown, this venture is focused in tracking what you listen to, learning what you like and giving you better music, just as I demonstrated my friends from Criticker do with movies. 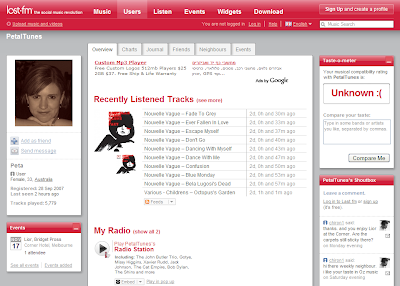 Founded by Felix Miller, Martin Stiksel and Richard Jones, Last.fm are a London-based company. As all interesting and popular web 2.0ventures, Last.fm has been recently acquired by CBS, and, yes, has an official company blog. Nice. Thanks go to my StumbleUpon friend petalthinktank, who has been using her Last.fm as her official homepage, shown in the screenshot above. Too bad I am not so much into music any more. Hardly have time for my late night movies anymore with all this blogging and stumbling and digging and twittering, not to mention being a new father. In the old days, when there was only Microsoft, software were always closed in the sense of not having an Application User Interface (API) for other developers to have their own software "talking" with them. Then came Google with their very different approach leaving everything open and inviting developers from other companies to join in the mashup game and generate new media content and additional value. The mashup concept is one of the most important aspects of the web 2.0 phenomena as it puts the power of media giants in the hand of every garage project dreamer. As well explained in this Wikipedia article: "...a typical example is the use of cartographic data from Google Maps to add location information to real-estate data from Craigslist, thereby creating a new and distinct web service that was not originally envisaged by either source." I bumped into BuddyMapping maps installed on quite a few blogs in the past but was never attracted to it, probably because I didn't like the way most of the maps I saw were brutally murdered into 150 pixels wide sidebars, which always look horrible. This simply doesn't work as the map needs space. Today, thanks to my StumbleUpon friend TheScrappyCat, I realized this is a very interesting new media application. 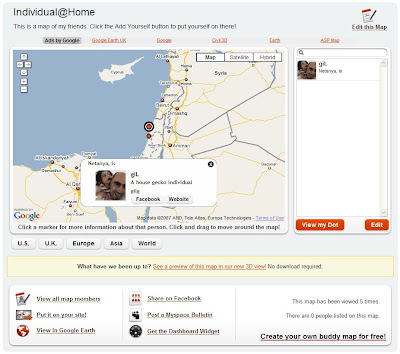 BuddyMapping make map-based guestbooks for online communities such as blogs, forums and websites. 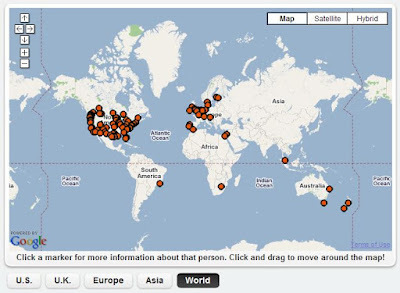 BuddyMapping enabled websites allow their visitors to sign-in to their map and by that place a red dot over their location, leave comments and attach pictures. 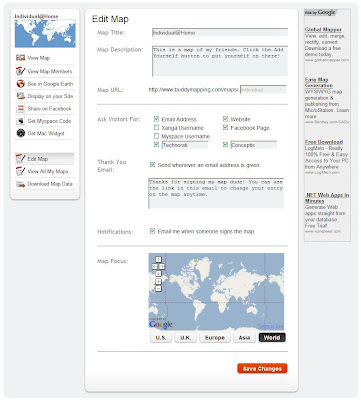 The BuddyMapping application allows the map owner to collect contact information from visitors based on a given schema including support for custom fields. Being a classic mashup mapping application BuddyMapping uses the open API of GoogleEarth and GoogleMaps. Thus, one of the coolest features it is able to support, which was actually the thing that dragged me into it when I subscribed to TheScrappyCat's map, is viewing the map in Google Earth. This is good because by doing that the user of BuddyMapping can enjoy all the benefits involved in using Google Earth. To put your map members in Google Earth, BuddyMapping serves your KML file for GE users to download and run. The file links to a data feed on BuddyMapping website, which Google Earth use to gather information about the people on your map. It updates hourly as (if...) people are added to the map. It might be a good idea to publish this KML file with an appropriate explanation in some place people can see it. You can just embed the map in one of your posts and link to it and to the KML file from your side bar. Important: BuddyMapping is only compatible with GE 4, so you may need to update it if you haven't already (Download Google Earth Version 4 here). Mac users claimed to be able to have the map running on their OSX Dashboard. I don't have an available OSX here but I know someone who does and might agree to register and give it a try. As you can see for yourself I am pretty lonely at the moment in my new digiworld but I am not worried. Maybe I am just an optimistic person but I have many friends and family and coworkers abroad. I am sure as time will fly by some of them will join me on my BuddyMapping page. The folks from Criticker, reviewed here last Friday, seem to doing lots of extra hours lately and when folks does that I tend to take my hat off as its not easy: following a recent successful launching of a Facebook movie application (screenshot above) Criticker just announced their new movie widget yesterday. 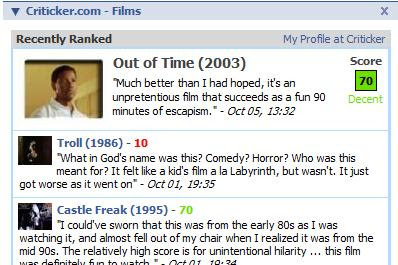 Blogoholic movie buffs are now invited to publish their personal movie taste not just on their FaceBook profile but also on any blog template and website supporting html widgets. The widget is auto updated with the recently ranked list every 24 hours. To get your widget code, login to your Criticker account (don't have one? get one here) and then go to the Resources page. The page serves all sorts of buttons and code streams including personal feeds, links & buttons, general feeds and widgets. The following is for my Recently Ranked Films. We all know advertising agencies have professionals working for them in making all the faces we see in their ads look perfect but how exactly is it done? This Photoshop tutorial from Lunacore Photoshop Training reveals the secrets of retouching art, showing step by step how the face of an ordinary human can be turned into a glamorous movie star face. The technique is indeed making the face look different but it also avoid unnatural results as often seen in such works. The tutorial demonstrate how to fix skin, remove blemishes and wrinkles, whiten and fix teeth, fix hair, fix eyebrows, increase definition in the eyes and crop and sharpen the image in the final steps. Thanks go to Stefan Smiljkovic (shtefcs) on Digg for shouting this to me. 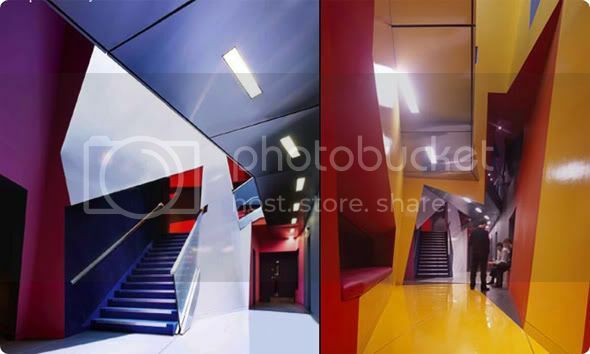 Other than being an avid Digg user and studding Computer Engineering, Stefan is also a 3D artist and owner of cg-files.com and cg-links.com. In other words Stefan is a cool dude. Check him out.